Today, Citroën has revealed C-Aircross Concept, a concept car with strong identity which offers a new vision of compact SUV and embodies Citroën’s capacity to be different, whatever the segment. Its design with a unique morphology adds to the dynamic attitude of the SUV, the fluidity of aerodynamic lines and the freshness of its color scheme. On board, it reflects a new step in the Citroën Advanced Comfort® programme with its light and airy cabin, including warm materials, and technology that makes life easier. 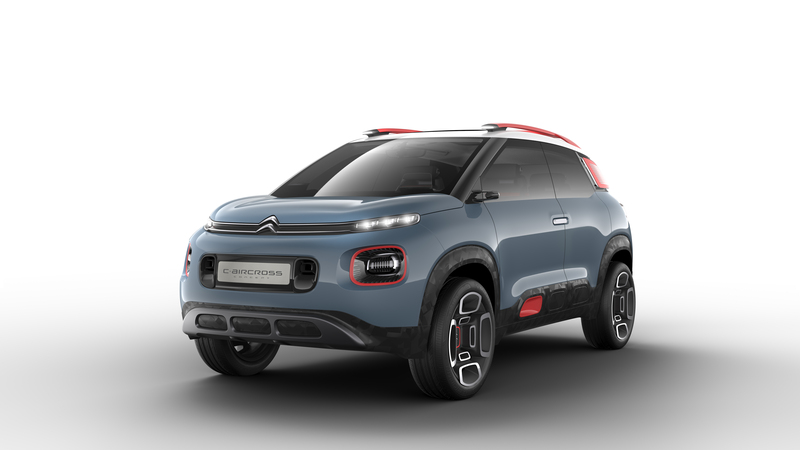 With its world premiere set for the Geneva Auto Show on 7 March, C-Aircross Concept heralds Citroën’s global offensive on the compact SUV segment. – DESIGN – an assertive SUV: C-Aircross Concept marks its difference into the world of SUVs with its totally strong, original and fresh attitude. It has a unique morphology and a right balance between protection and fluidity of lines. Its modern body style comprises generous shaped parts which contrast with strong graphic features and splashes of colour. Its also suggests an impression of space on board, where colours and materials creates a both technical and relaxed atmosphere in a very stripped back style. – COMFORT – a modern SUV: the opposing opening doors of the Citroen Aircross Concept open onto a spacious cabin, an invitation to embark on adventures with complete peace of mind. The concept offers space, wide quilt-effect seats, and plenty of light, owing to its panoramic sunroof. Inside the car the foundations of the Citroën Advanced Comfort® programme can be seen, and technology serves to improve ease of use, for example: the colour head-up display an aesthetic blade in continuity of the instrument cluster, single spoke steering wheel with intuitive commands, rear view camera vision and wireless induction charging for smartphones.